Far from being merely the subject of science fiction novels, robots have become a new center of attention for technology experts, researchers and companies. The interest in robotics is more than theoretical. A considerable amount of time, effort and money is being spent on these tools because of the real benefits they may bring to industry. Manufacturing, in particular, stands to derive key operational advantages from the introduction of robotics into the production process. The technology can help companies automate and streamline certain aspects of their operations that previously had to be carried out manually, thereby providing a new business cost reduction strategy. 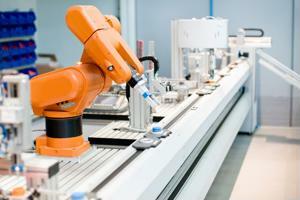 Technology companies are well aware that the robotics market may be poised for rapid growth. According to The New York Times, Google has acquired seven companies specializing in the production of robots - and that's just over the past six months. A source in the know, who chose to go unnamed, told the news source that the Mountain View, Calif., technology titan is planning to target robotics tools to manufacturers, specifically those that have primarily manual assembly lines, such as within the consumer electronics market. "The opportunity is massive," Andrew McAffee, principal research scientist at M.I.T. 's Center for Digital Business, told the Times. "There are still people who walk around in factories and pick things up in distribution centers and work in the back rooms of grocery stores." Robots in the distribution center? McAffee's remarks point toward the ways in which robots might benefit operations across the entire production supply chain. If robotics tools can help companies manage their manufacturing labor costs, they may also be able to help streamline operations in the distribution center. Supply Chain Digest contributor Cliff Holste noted in a recent column that distribution centers bear a certain resemblance to production facilities. "To begin with, order fulfillment in the DC is a highly repetitive process, which is a common characteristic of manufacturing assembly lines," Holste wrote. Holste sees the distribution center of the future leaning increasingly toward automation. He noted that many providers of these material handling technologies have already gained traction in the European and Japanese markets, but the United States remains a "virtually untapped market" for these tools. And with the retail supply chain increasingly tasked with shipping high volumes of e-commerce orders, the need for a distribution process that is maximized for efficiency is particularly great. As companies look to adopt automated, hands-off processes, robots may soon help firms reduce the overall costs of maintaining distribution centers.